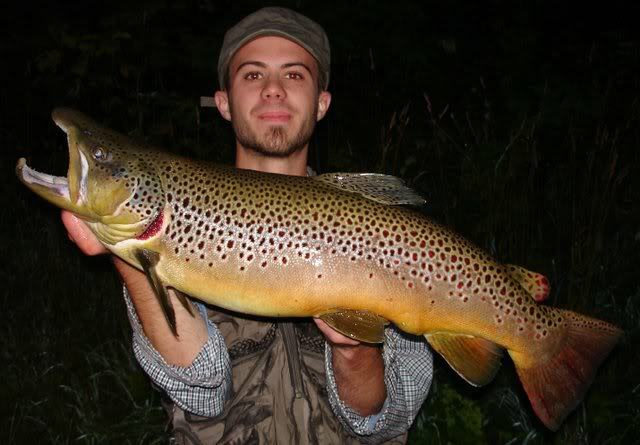 Driftless Trout Anglers » Trout Fishing » Stream Advice » Richland Co.
Legend has it that this monster was caught on the Pine River near Richland Center (I have no proof, just what I was told). Notice that the photo was shot at night. Your best bet for getting a really big Trout is after hours. Bigger water always holds the possibility of bigger fish, as there will be more food there than in a smaller stream. But this would be an exceptionally rare Trout for the Driftless Area. Is the Pine very wadeable for smallmouth? Always looked pretty silty/muddy to me. Wading may be possible on the upper parts of the Pine. But anything below Rockbridge would be risky. Pretty deep and muddy. 1 user thanked snbrd4evr for this useful post.